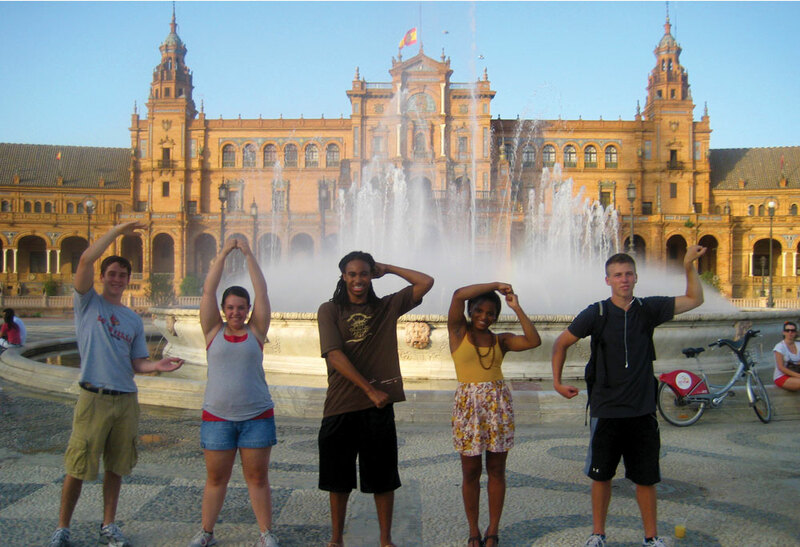 At the end of the spring semester I attended the study abroad orientation hosted by the University of Louisville’s Study Abroad office and part of what they tried to tell us was that we would experience a roller coaster of emotions during our trip. I didn’t really believe it and thought that I was mature and smart enough to be able to avoid it. Come to think about it the last couple of days have been indescribable. In my personal life everything has changed and emotionally it’s chaotic and complex. There are moments when I’m able to hide it and then there are times like yesterday when I just couldn’t. I’ve been listening to playlists like The Cure for Loneliness, Unrequited Love, One of Those Days, etc. I’ve listened to those for hours and tried to find words to express the emotions but I just can’t. The mixture of emotions only gets compounded when I realize that I am lost. Lost in the sense that nothing is the same and I am outside of my comfort zone. I miss eating my favorite food, watching my favorite shows, spending time with friends and family, and just being lazy. But I signed up for this and it is my sincerest hope that being able to survive this experience will help me become a better person in all aspects of life. I often rely upon quotes to assure me that I am not the only one who is experiencing these feelings but so far haven’t been able to much so if you have any quotes or advice, please let me know! After the first week of school, I ended up changing my schedule to have Friday and Monday off. This should allow me to have plenty of time to travel and explore other cities and countries. One key thing that I have noticed is that in 4 out of my 6 classes the professor had no control of the class, multiple side conversations, people watching videos on Facebook, and it was almost impossible to hear the professors. In my experience when this happened in the states the professor would usually ask the student to leave the class! For that one negative observation there are a thousand positive ones. I got a chance to literally rope down (pictured below) from the top of the main building. There were multiple student organizations with various booths, free coke, free student boxes, and so much more. The school building also includes a bar. Yes you read that right, a bar in the same building as the school. The people here have been very understanding of my situation and always managed to put a smile on my face. This past Friday we attended the Oh Oh Intro festival and the best way I can describe it is Welcome Week at the University of Louisville but way more fun. Beer was sold to anyone over 18 (I’m 21), a stage with multiple DJs, various booths from student organizations and more. I ended up crowd surfing during the festival and it was one hell of an experience. Apart from all these experiences it is fascinating to be able to observe a culture where people live a happy life. Going out to the bars (almost daily) is always guaranteed to be fun because hundreds of people sit out together and spend time with friends. It doesn’t matter what day of the week it is because having fun and spending time with loved ones isn’t a chore but a part of life. It is also incredible how many Turkish restaurants exist here and across Europe. I keep meeting more and more people from Germany and I am convinced that their university experience is much more captivating. Apparently you don’t have to go to class in Germany at all as long as you pass the class. I met Julia, who visited New York during school, and just studied for the finals after and passed. To top that off, they don’t have homework once you’re in the university and no essays to write! I went to a church (after a long time and on my own accord) in The Hague around 5:30 PM (Netherlands Time). Corey, Chase, and I just booked our hostel for the trip to Paris this coming weekend. My friend from back home Mitchel Payne, who is studying abroad in France, is going to be joining us for the Beyoncé and Jay-Z concert! I’ve been in Den Haag for a little over 26 hours and it’s been a very interesting journey so far. I’ve come to love this place even though I don’t understand Dutch at all. My flight path was from Cincinnati to Philadelphia to London to Amsterdam. Upon arriving Amsterdam I was to purchase a ticket from the train station located directly under the Airport. There are multiple yellow machines that dispense tickets. However, they only accepted Chip + Pin card or Euro coins. As fate would have it, I only had cash so a wonderful person guided me to a booth where I could use cash. I bought my tickets for €9 and headed towards the platform. At the platform I initially took the wrong train because I was supposed to go to the station called “Den Haag Holland Spoor” (HS) instead of “Den Haag Central”. Luckily I stepped out at the right time and was able to get on the correct train. After about 40 minutes I reached Den Haag Holland Spoor and my directions were to call the pick-up service and then head to the pick up spot near the train station. After dragging my main bag (51 lbs.) and carry on (25 lbs.) for about 1/2 a mile and struggling to use a pay phone for 30 minutes I realized it wasn’t my fault at all. Apparently the new number was sent out to all the students and I somehow either didn’t receive it or missed it. Despite having to walk around with my luggage for an hour, I finally found the building where the wonderful people from InterAccess made things so much easier. Dennis drove me to my apartment along with Romina. People in The Hague love beer, are kind, and very helpful. They also drive on the right side of the road, which isn’t something I was expecting. Almost everyone rides a bike regardless of whether you’re a 5 year old kid or a business woman in her 40s wearing a suit. At this point I’m all settled in and am slowly starting to find my way around the city. I got a new Dutch sim card and the OV-Chipkaart which is used to pay for trams, trains, and buses in the Netherlands. I’ve also decided to rent a bike so I can explore the city a bit faster!